The site leads with a reminder that the U.S. is the sole developed nation that doesn’t mandate some paid maternity leave. 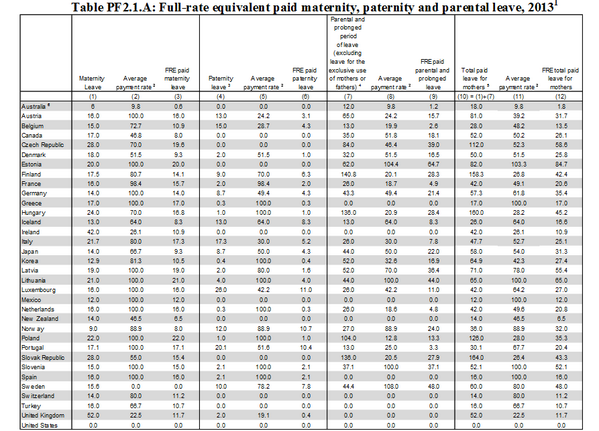 Indeed, the U.S. is the only country within the Organisation for Economic Co-operation and Development, a 34-nation group that includes some of the world’s largest economies, that provides zero weeks of paid maternity leave (check out the table below). Meanwhile The International Labour Organization, a U.N. agency that sets “decent” work standards, says maternity benefits should be at least 14 weeks.